Approximately thirty members of APTA, family, and friends gathered at the Alexander-Ready-Cates Farm at Porterfield on Sunday, Oct. 18, for the unveiling of the APTA (Association for the Preservation for Tennessee Antiquities) marker. The marker was covered with a woven blanket belonging to the home's builders, Mary Annis Alexander and Christopher Columbus Ready, and the official removal was done by Ashley, David, and Benjamin Cates, current residents of the home. The home, located on a 175 acre farm, also on the National Register of Historic Places and a Tennessee Century Farm, is owned by Mrs. Mary Dee Ready Cates, of the Cripple Creek Community. She was born there on May 20, 1913. The farm where she resides near Readyville is also recognized by an APTA marker and listed as a Tennessee Century Farm and on the National Register. Following the unveiling and viewing of family pictures and memorabilia assembled by Steve Cates for the occasion, David, Ashley , and Benjamin opened their home for touring, visiting and refreshments. Food was served in the only original room of the 1870 home built by Chris and Mary A. Ready, first used as the kitchen and now used as the dining room. Pictured are descendants of Christopher and Mary A. Ready in front of the marker. 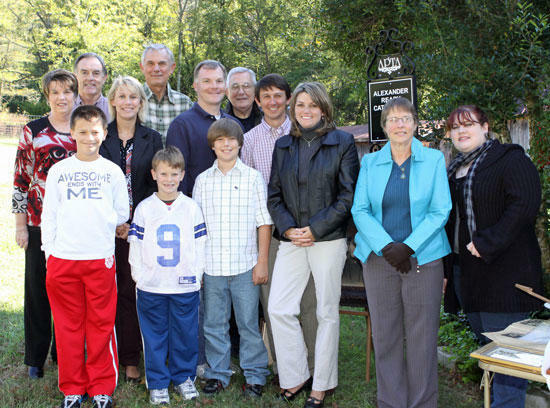 They are, left to right , front row - Bryan Jakes, Joseph Jakes, Benjamin Cates, Ashley Cates, Paula New Hughes, and Hailey Hughes;back row - Janet Duggin Barnes Harry Barnes, Shannon Cates Jakes, Ben Cates, Andy Jakes, Steve Cates, and David Cates.